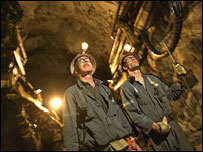 Anglo-Swiss mining firm Xstrata has effectively taken control of rival mining group Falconbridge. Xstrata said it had control of 92.1% of the Canadian firm as it extended the deadline for its all-cash bid for the remaining shares in the company. The 62.50 Canadian dollar (US$55.29; £29.31) a share offer will now expire on 25 August. The news comes just over a year since Xstrata bought its first stake in the company, at a cost of C$28 a share. Earlier this month, Xstrata has said it would pay for part of any successful acquisition of Falconbridge by a shares issue. The announcement should bring to an end a prolonged takeover battle for Falconbridge. Inco, another Canadian miner, pulled out of the bidding in July. Inco itself is now likely to be taken over in a $17bn deal launched last week by Brazil's CVRD. China's dramatic economic expansion has triggered bid fever in the minerals sector. Nickel and copper are in short supply in China and this has pushed metals prices higher. Xstrata is listed in London but has headquarters in Zurich. A shareholder meeting will take place on 14 August with video links between both locations. The company mines coal, copper, zinc and alloys around the world and sells on its technologies to other mining concerns. The takeover of Falconbridge will make Xstrata the world's fifth biggest diversified mining company by market capitalisation and boost its copper and nickel portfolio.